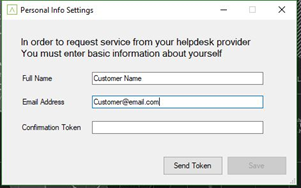 After you activate the Helpdesk Agent on your customers' devices, there is one more step before your customers can begin opening tickets on their own (either by right clicking the HelpDesk Agent icon or using the Control + F12 hotkey). They will need to do a one-time authentication of the Helpdesk Agent (for purposes of identity confirmation). 1. Right click on the Helpdesk Agent, and select Personal Settings. The Personal Info Settings screen appears. 2. Fill in their full name and email address, and click Send Token. A token will be emailed to them (for purposes of identity confirmation). 3. Check their email to obtain the confirmation token, then enter it into the Confirmation Token box on the Personal Settings screen, and click Save. They can now open tickets and utilize all the features of the Customer Portal. 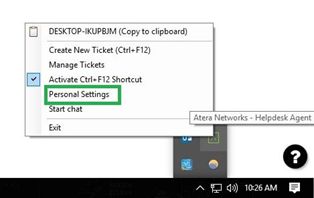 Customers can create a ticket by using a hotkey. Customers can create a ticket by right-clicking. The Add Ticket form displays - the customer can now enter a new ticket.